A man-on-the-street impression is that the Pioneer Company of American Protestant missionaries hopped off the boat in 1820 and was promoted on the spot to $$1 (navy jargon for still smasher first class). It turns out, while the Pioneer Company of missionaries left the Long Wharf at Boston as scheduled, on October 23, 1819, they then lay at anchor in the Presidential Roads. Anthony D Allen (a former slave from the continent) had his home at about where the Washington Middle School is situated (including about a dozen other houses.) Several references note his property as a “resort;” “… it is a favourite resort of the more respectable of the seamen who visit Honoruru. …” (Reverend Charles Stewart) It may have been Waikiki’s first hotel. • 1 qt. of rum. • 2 ¼ gal. of wine. The first whalers (1819) and missionaries (1820) arrived in Hawaiʻi at about the same time. That is about the only thing a lot of them had in common. One of the areas of the great divide between them had to do with drinking liquor. The first temperance movement emerged in New England as clergy began to equate drinking alcohol with sins like Sabbath breaking and blasphemy. In 1808, the first temperance society was formed, but it singled-out hard liquor, such as rum, as its only target. In 1831, the large and influential American Temperance Union urged everyone to only drink cold water (not alcoholic beverages) thereby taking a Cold Water Pledge. In Hawaiʻi, King Kamehameha III and most of the chiefs pledged themselves to total abstinence, and, in part, became zealous preachers of temperance; the king himself frequently addressing the people on the subject. Pūʻali Inuwai (“The water drinking host”) was formed on March 15, 1843; the Cold Water Army – Hawaiʻi’s version of the Temperance Movement. Following the model elsewhere, they first looked to the children, suggesting: if you had 100 drunkards and tried to reform them, you would be lucky to save maybe 10; however, if you had 100 children and taught them temperance from a young age, you could save 90 out of the 100. Hawaiʻi youth were encouraged to join. Interesting … not knowing the actual date, Kauikeaouli selected St Patrick’s Day as his birthday. St Patrick was said to have proclaimed that everyone should have a drop of the “hard stuff” on his feast day after chastising an innkeeper who served a short measure of whiskey. In the custom known as “drowning the shamrock”, the shamrock that has been worn on a lapel or hat is put in the last drink of the evening. 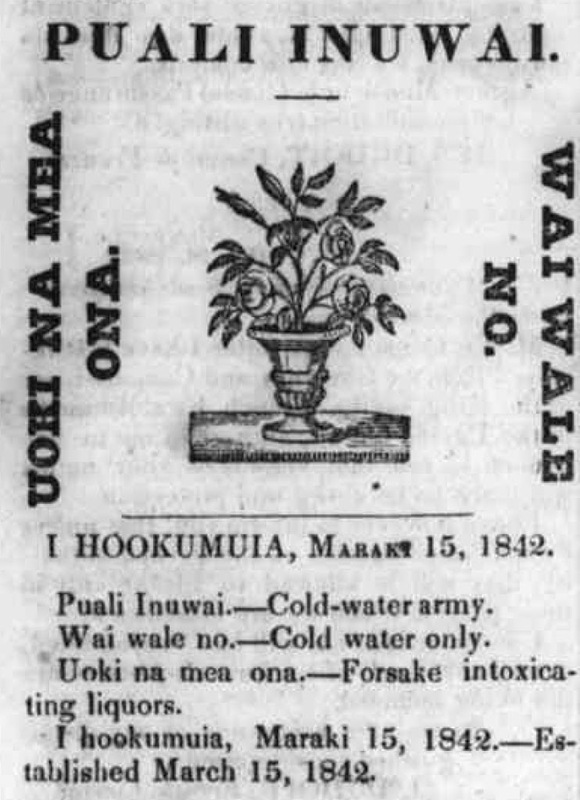 The image shows a Pūʻali Inuwai badge and mottos. In addition, I have added other related images in a folder of like name in the Photos section on my Facebook and Google+ pages.